On February 20th, 6D Helmets will be unveiling its all-new ATR-2 off-road motorcycle helmet, which features an advanced ODS system heavily influenced by work completed inside the NFL’s Head Health Challenge III competition. As a valued 6D Helmets partner, we look forward to sharing this experience with you through live video streaming at Facebook.com. 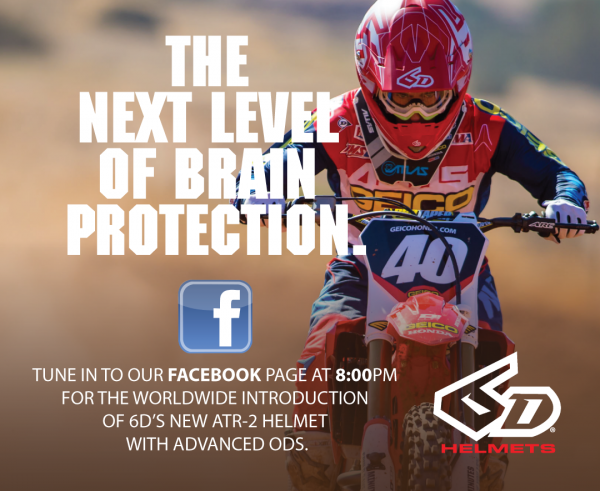 The live streaming will begin at 800 p.m., and can be viewed directly from the 6D Helmets Facebook page (link below). At the time of the event, 6D Helmets will also be sending you additional information and images on the all-new helmet. All details pertaining to this event are embargoed until February 20th.